A staffer at a high kill shelter called Blind Cat Rescue about the 6 week old special needs kitten and SweetPea was saved. 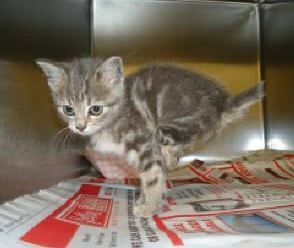 Ann from Cumberland County Animal Control Center in Fayetteville, NC called Blind Cat Rescue and Sanctuary, the nationally known special needs cat rescue in St. Pauls, NC in hopes that they would be able top take a young kitten born without her back feet and with only half a tail. Blind Cat Rescue agreed to take her, and as of this past Wednesday, SweetPea is in residence at the sanctuary. The vet thinks that the kitten’s umbilical cord was wrapped tightly around the missing feet in utero, cutting off the blood supply and causing her to lose them. SweetPea is receiving antibiotics and pain medication for osteomyelitis, a bone infection, and she has a a fractured femur. She seems otherwise to be in good health and good shape. The series of videos below show her walking during her examination, coming into close-up in her crate, and happily at play. Blind cat rescue says that the lack of those hind feet does not slow SweetPea down at all. SweetPea is still very young, and there is no word on whether she will be fitted with prosthetics or have any surgeries to give her pads at the ends of her legs. Most importantly she was rescued and is safe and in good hands. SweetPea at the vet during her exam. More SweetPea; a brief close up look at the adorable girl. awwwww that poor baby! Born with out hind feet! Thats horrible! Atleast she can get around ok….. Thank God for your shelter, more are needed like yours. Too many call themselves shelters and only ” kill” the animals. You Are truely a Godsend. LeighAnn, we don’t see anything from you, so please share your comment here. Thank you.